Two hospice nurses share the stories and examples of Nearing Death Awareness experiences of the dying. These experiences, when shared with family members, can be wonderful final gifts of peace and comfort to those who are left behind. His newest novel is full of spiritual truths, historical facts, and information about our nation's forefathers, many of whom were members of the Masons. An exciting story even if there are some gaps in logic that left me shaking my head. He's not the best writer, but he does a lot of research into his subject matter. The Jesus that Chopra presents to us is a teacher of God consciousness and a walking example of one who lived in this state of consciousness. I most resonate with this Jesus and even those who do not see themselves as Christians will be inspired and fed by the teachings of Jesus as they are presented by Chopra. This is one man's amazing journey from a successful career with Microsoft to a life of service and charity, with the goal of giving the world's children a chance to read books and go to school. A book about personal and organizational change from a spiritual perspective. The spiritual journey and love story of a cloistered nun who falls in love with a priest. Beautifully written and compelling. Highly recommended. A courageous memoir written by the ex-wife of a Christian fundamentalist minister. An enthralling tale of betrayal, a quest for truth, and a woman's decision to do the right thing for herself and her family. A delightful memoir about Gilbert's one-year sabbatical following her divorce. She seeks to find pleasure again in Italy, to find God in an ashram in India, and balance in Indonesia learning from an old medicine man. A spiritual journey (and, in the end, a love story) that is fun, humorous and wonderfully told. This book gives you the key to unlocking the door that can lead to a life of inner peace and joy. If everyone in the world would read this book there would be no more war. Based on the teachings of Jesus Christ, this book provides the esoteric meanings of words, names and places. A valuable resource for all Bible students who want to delve into metaphysical interpretation of scripture. This is one of my favorite books on prosperity. It is clear-cut, no nonsense, and teaches the spiritual principles of success. One of the best books I know for people dealing with life changes. It will guide you through the major changes in your life and help you grow spiritually. A new view of Christianity focusing on Jesus as teacher rather than rescuer and on love rather than religious dogma. A provocative and courageous look at how literal interpretations of the Bible have been used to justify slavery, ban textbooks, deny the rights of homosexuals, subordinate women, and justify war. I just finished reading a riveting memoir written by the ex-wife of a Christian fundamentalist minister. 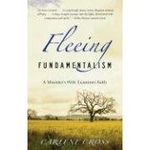 Fleeing Fundamentalism: A Minister's Wife Examines Faith is Carlene Cross's disturbing and compelling story of when religion goes wrong and what it is like to be the wife of a man who interprets the Bible literally and according to his own self-interest. Cross not only shares what it is like to raise three children with a man who preaches one thing and practices another, but she also takes us with her as she begins to question her fundamentalist beliefs. Through research into the Bible and the history of Christianity, she learns that the literal interpretation of the Bible goes against common sense as well as theology. Like a loose thread that begins to unravel, her marriage and her faith are called into question. This is an inspirational book of one woman's courage and decision to do the right thing for herself and her children, to question her religious heritage and the hypocrisy it presented, and to share this personal journey with others. In reading this book, you will find yourself enthralled by Carlene's story and you will also learn much about Biblical scholarship and Christian theology. Additionally, it is a warning about how the religious fanaticism that we have witnessed on the part of fundamentalist Christians can hijack our constitutional rights and foster prejudice. The Virgin Birth: Fact or Myth? I have selected photographs that make me smile and brighten my day. I hope they will do that for you as well. Click on the photos to see an enlarged view. I invite you to visit often and see what I add to my collection.